There’s something effortlessly cool and engaging about the man-mountain sat before me, slumped back in a chair, sipping wine in his Shepherd’s Bush hotel bar. That man is Gregory Porter, the man with the best voice in modern jazz, and a man with a hell of a story to tell. Instantly recognisable because of his trademark “jazz hat”, in person he speaks with a beat, a captivating rhythm that clearly flows through his life – past, present and future. As a young man with a promising American football career ahead of him, before injury scuppered his chances, and driven down the musical path by his mother on her death bed his is an inspiring story that almost deserves its own movie. Years of honing his craft sees him in the spotlight at the age of forty. His jazz informed by soul, blues and gospel music, has gained fans in the likes of Jools Holland and Jamie Cullum, and has culminated in his newest release Liquid Spirit. It is in this ongoing ascendance to the top we meet him on a promotional jaunt to the UK. It is clear that music is a natural state for Porter, from singing along to Nat King Cole records and writing his first jazz song aged just six sound is his life, but without his mother his music would have never made it out to the world. That ‘risky route’ has paid off - his profile over here is growing. Our conversation takes place the day after an interview and live-performance on BBC Breakfast, and the rest of the trip involves a ton of interviews for press and radio. The man with the soulful voice is in increasing demand. With Liquid Spirit, his first on the legendary jazz label Blue Note is his most solid collection yet and looks set to spread his gospel of jazz to a wider audience. His blend of classic jazz, gospel and soul influences creates an “organic” sound with deep messages that act as a counterfoil to much of the cookie-cutter, polished emptiness of modern “pop”. “There’s a movement in food to get back to an organic – simpler flavours, like ‘oh that’s what cabbage tastes like’. Unadorned. Yeah, I am adorned with arrangements and music, but my voice is my voice. The many times I step to the microphone, what comes out of my mouth is what goes on the record, it’s not altered, it’s just me. The common theme of our chat is speaking from the heart, an personal ethos that again stems back to his mother. 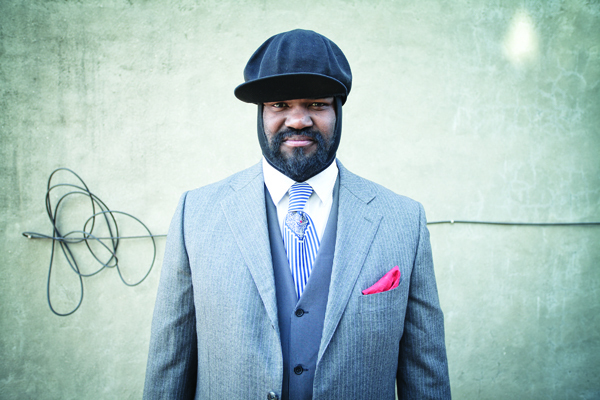 The music of Gregory Porter oozes “understanding”, which is why he is touching the souls of an increasing audience. Tracks like the ode to the broken hearted “Be Good”, deep political protest song “1960 What?” and optimistic love dong ‘Hey Laura’ illustrate his deep and wide understanding of the human condition. His musical mission seems to be one of elevating consciousness, accentuating the positives. The song ‘Musical Genocide’ from the new record acts as a manifesto for positive sound, as Porter tells me: “The music of the seventies, that ‘soul man’ that I am talking about in the bridge, you know Donny Hathaway, Curtis Mayfield, Marvin Gaye – the trajectory was, this way, ‘someday we’ll all be free’, ‘you’re winner’ – it all had a positive trajectory. These days Porter is treading his different beat across the globe, and his adventures have led him to some unexpected places of our green and pleasant land. Talking of his tour with Jools Holland he lights-up talking about, of all places, Skegness! “We did a bunch of different places like Bridlington, from the larger cities to the small cities. Sometimes I go through life as documentary and not looking for the creamiest crème de la crème of places – I enjoy the atmosphere. It’s not something to look at and make fun of it’s just something to experience because Skegness, whatever we think of it, is someone’s number one vacation place, the funnest place they have ever been to, and I dig that and would probably have a bunch of fun there. With the goofy rides and whatever they have there. I had some greasy fish and chips and that was terrible. “I loved it. I look at it from this point. This seems like a working-class place by the beach. There’s probably too many fat plastic clowns out on the sidewalk but I dug it. I thought it was interesting. I don’t look for the perfectly manicured lawn every I got to a city. Sometimes you wanna go to that rib shack or burger shack that’s like, a little bit fucked up. There’s going to be some humanity there. As our chat draws to an end, I have to ask “what’s the deal with the hat”? “It’s me. It’s my hat, my style, my thing. It’s part of my skin. I do get recognised in airports, if people have only caught a glimpse of me on some late night television show, they are like “I know you, you do something”. They haven’t figured it all out but they know. Liquid Spirit is out now on Blue Note.